But first, should I even be writing about a fellow skipper’s embarrassing and possibly costly mistake? 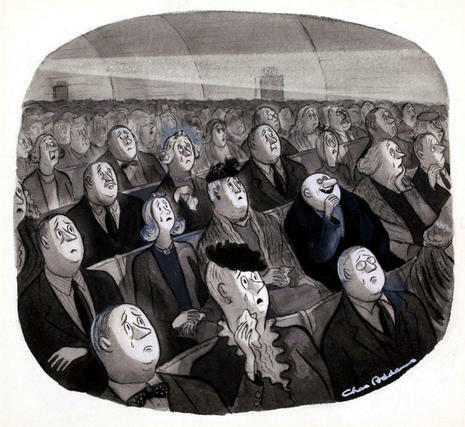 I’ll lay some blame on my parent’s beloved collection of Charles Addams cartoon books. This one — called “Sailing SuperYachts” and well documented here — has been stuck in my head for at least 60 years, and I sometimes remember Uncle Fester’s contrarian glee when I’m pleased to test radars and such in fog and rain. And while I did not actually enjoy being first on the scene of the grounding, it is way too rich in interesting detail and possible lessons to leave undocumented. 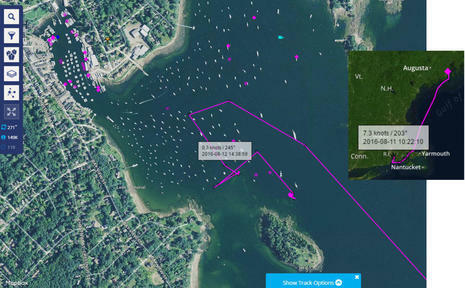 Let’s start with the fact that the big sloop grounded right on the clearly charted 3-foot area that’s also guarded by green USCG navigation buoy C “7”, seen above on the 1:20,000 scale NOAA harbor chart available for this area (though little of the Maine coast is charted in such detail). But please don’t make presumptions quite yet. 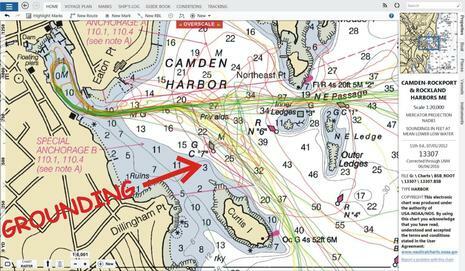 By the way, note that NOAA recently removed the partially misplaced and confusing “private aids” that Camden uses to mark the channel between the mooring fields, which I gently complained about in 2010. Note, too, how the somewhat random set of Gizmo tracks seen on my office copy of Coastal Sailing in Phuket Explorer pretty well defines that channel and also indicates that I, like most local boaters, rarely mess around in that shoalish area between C7, Curtis Island, and Dillingham Point. …I was surprised to see the sloop hung up hard — bow thruster fully emerged, in fact — right where I’d been surveying about an hour and half earlier. Those poor sailors identified the reported trouble spot better in real time than I did with all of Gizmo’s sonar gear. To be clear, this view is northward with Can #7 seen just right of the grounded boat’s bow (and taken just after I’d made another track through the little-used Dillingham/Curtis passage). At left is the crew kedging an anchor, which they then used in an attempt to twist the stern southward and motor in reverse off the obstruction. That did not work at all, and frankly was not a good idea given that the tide still had a few more inches to fall and there were barnacle covered rocks visible around and beneath the hull. But there’s more to that story, too. Thanks to Marine Traffic and the volunteer AIS listening stations which make it work (more needed), we can see that before the grounding these sailors had been underway for over 24 hours. They left Rhode Island just after dawn, local time, on Thursday and crossed the Gulf of Maine during the night. They may well have encountered thunder storms and/or fog, and the trip would have been tiring even if they didn’t. Using the larger image above, you can almost hear what happened next. 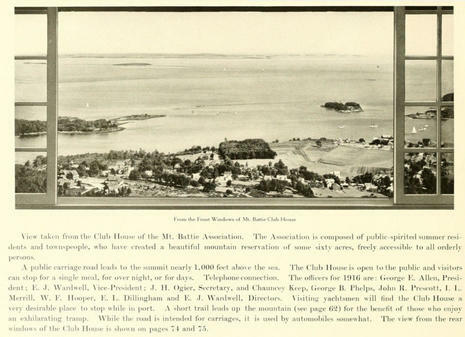 They were likely talking by VHF or cell phone to the yacht club or marina as they entered Camden Harbor and just a little way into the channel they got assigned a mooring on the north side of Curtis Island. So, they cut through the mooring field until — bang, grind, done! — their keel found that shallow rocky patch and they eventually realized that they had to sit there for several hours before getting to rest, eat well, and enjoy this beautiful town. I did actually hear some of the cursing. I don’t know about you, but it took me a while to realize that my nautical skills and judgment are substantially diminished after a night or more underway. And, by the way, I did motor over and try to comfort the grounded sailors about how soon the tide was going to change. The AIS history helps to better understand their mood (and I swear I was not grinning like Uncle Fester ;-). It happens that I was also testing a Garmin Virb XE camera mounted at the masthead along with the recently discussed gWind sensor that is also wirelessly integrating with Gizmo’s just installed GPSmap 7612. The results are pretty sensational and will get detailed coverage soon, but the story told here is how innocent it looked to drive through the mooring field to that cursed spot. Note, for instance, how the bottom appears quite flat with the depth gradually increasing as I motored toward the grounded boat (though it would be nice if Garmin’s Virb Edit team turned the depth graph right side up). 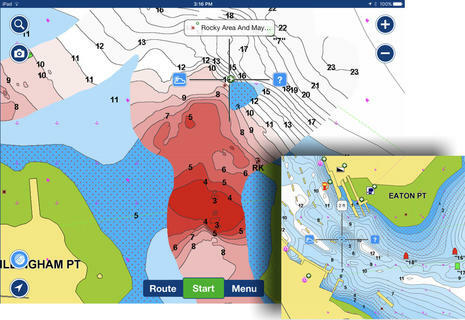 Navico GoFree Insight Genesis provides the best sonar information about the grounding spot that I’ve collected and viewed so far. Please click the collage above bigger and look for the little orange track dot on the left. At that moment I was doing a clockwise loop around the grounded sloop quite close to its port side and looking down at some scary rocks, as suggested by the DownView sonar window that goes with that track point. The righthand screen shows an even steeper and pointier situation that I’d imaged earlier in the day and higher on the tide (but didn’t notice at the time). Also, included in the collage is the tide offset information for the processed sonar map, and it looks reassuringly accurate, though I suspect that one or more of those rocks may be less than 3-feet deep at Mean Lower Low Wide (or MLLW, the chart depth datum). And remember NOAA’s recently discussed Zones of Confidence; this area was last surveyed during the period 1940 to 1969 and thus NOAA’s accuracy confidence is no doubt low. 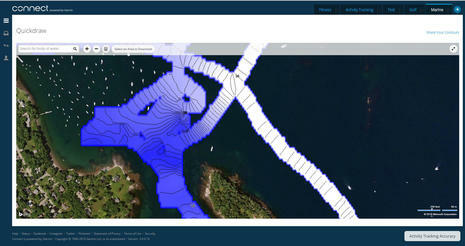 Here’s what Garmin Quickdraw Contours look like now that users can also share them online. 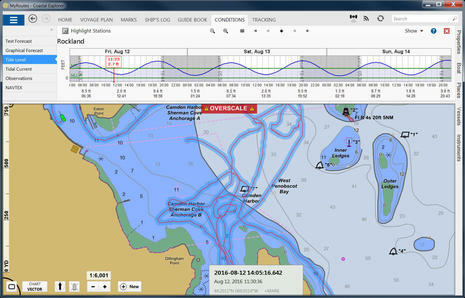 I was disappointed that the Quickdraw specific points of interest that you can add on an MFD don’t seem to travel with the community files (yet), and I also doubt that those soundings are tide corrected, but the collect and share system is young and mostly aimed at fresh water, and it’s pretty easy to use even now. I think that crowdsourced depth data is an interesting work in process, especially for tidal areas and especially for this sort of “watch out” detail. But it is helping me to document the issue, crowdshared points of interest like Community Edits do work to some degree, and I’ve already added an Active Captain hazzard mark which will be seen by many cruisers new to the harbor. I was a little surprised at the FaceBook effect, however. 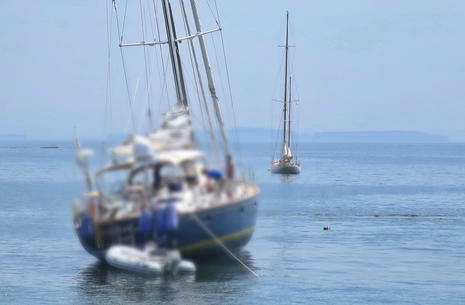 I posted that masthead video on my personal timeline yesterday and a number of local boaters have already reported bumping on that little rock patch, which now looks like it’s safely among deep-draft moored boats. Maybe the momentum builds for the town to mark it with a pole or isolated danger buoy? Some will say that the chart and C7 buoy mark the danger well enough, and certainly a whole lot of boats did not go aground while that nav aid has apparently been on the job since at least 1886. 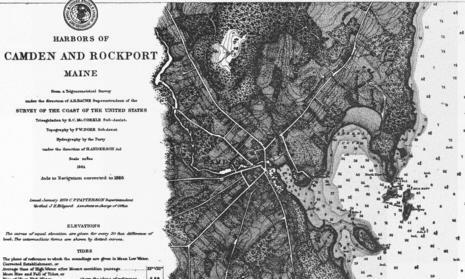 I wish I could find a higher resolution version of the old chart, but even the (click big) version above suggests that the cartographers charted some sort of ledge where now it just shows a 3-foot plain. And you can definitely see the incredible contour, road, building, and forest detail they were able to map without any of our technology. Are we really making progress? While searching for high res antique charts I did come across a wonderful 1916 book called Glimpses of Camden (fully viewable, downloadable and in the public domain). Yes, there were few boats moored in the Outer Harbor then, but much of natural beauty and even the summer style of a century ago is still very much on view around here, and that’s why it’s worth even a long passage and/or an occasional boating surprise.